I thought I was imagining it. But there are lag spikes that are up to 1000ms that aren't being reported on-screen. Like flying along, and you line up your victim, and press the button. You see cannon shells go out, they look like they intersect with the target, but you get no auditory clue that you've made contact, and your opponent just flies on. Over a second later, you hear all the auditory hits compressed, see that you've destroyed the other plane, and your mind says, "whiskey tango foxtrot, over?" This happened in a sealclubbing match on T2, and just now with my Me262 on T8. 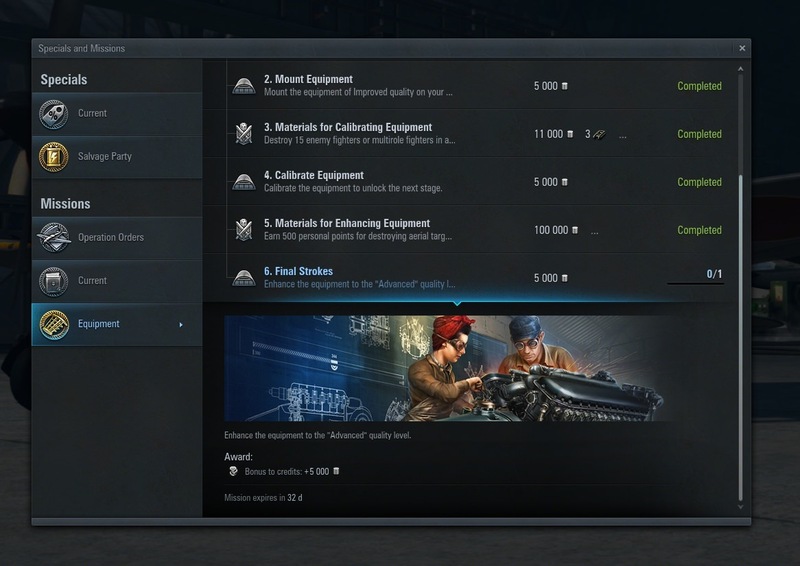 And let me tell you, with those 30mm shells on T8, I can't afford giant lag spikes. SonicPariah, you want to wade in on this one? Edited by CorvusCorvax, 15 June 2018 - 02:01 PM. 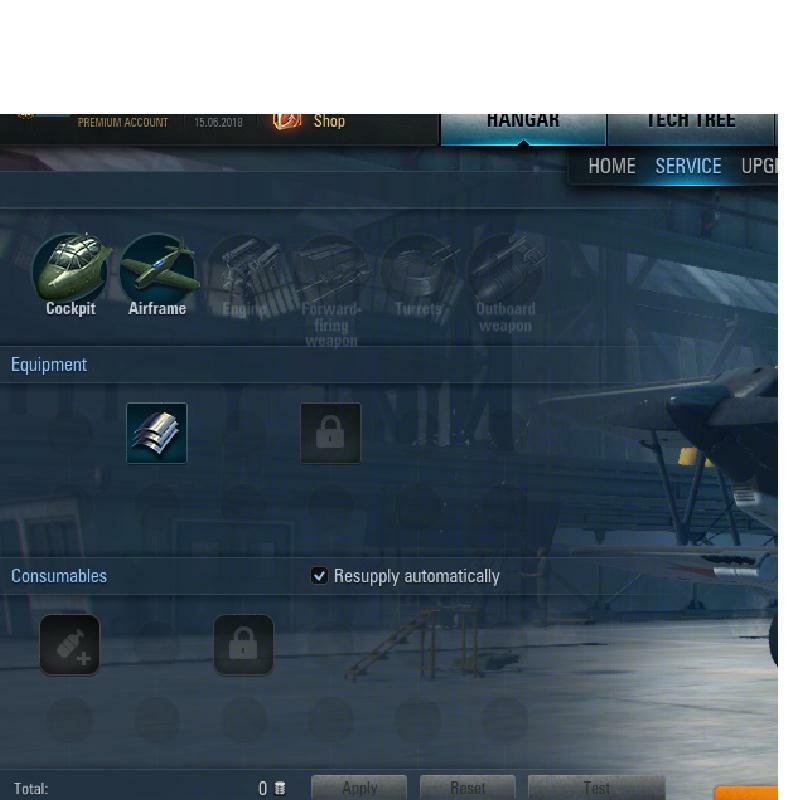 Ammo moved to the Consumables section, should be available under Forward Firing Weapons in all planes. Edited by Fliyntiger, 15 June 2018 - 02:07 PM. Yup. And it is NOT toward a 1.x playstyle. Yes, only in dollars, too. Hrm... but why would I pay for that? The economy seems easy enough and it defeats the purpose of introducing all this new content if you can just buy your way through it using loot crates? [Edit] Oh, actual lootboxes. Like the Santa Sacks. feh. I've spent too much on those already tbh. Edited by SpiritFoxMY, 15 June 2018 - 02:47 PM. Yeah - I've had a few cases of that myself, most notably an La-160 that exploded two seconds after I'd boomed past him. Edited by hoom, 15 June 2018 - 02:41 PM. OK, three battles now, and gigantic lag spikes that are not reported by the software. Three losses, even though I am fighting against bots and low-skill humans. I was killed each time after the squall line during a lag spike when there was no red player on my minimap (set at 1.2km). I will pay on a different set-up later to see if the spike is part of the set-up here, but if this is the way life is going to be under 2.0.5, then i will wait until the next patch to play again. Oh, and spend zero money between time. SonicPariah, maybe you want to pass this info on? I'm not going to re-list some of the pros and cons that other people already have. I would also like to say that one person's "pros & cons" might not have the same relevancy to another. It is unfortunate that there are so many problems with the quality of the game play because of different circumstances. That said, here is my take from playing last night. I noticed a jump in frame rates and all night I was at a range between 60 and 100, with an occasional dip into the 50's but it was all great. No crashes, so at least last night I did not experience that at all. (Just me flying into some mountains and cliffs) The graphics seemed sharper and more vivid. I noticed the defense bots were a lot more aggressive, which I think was more clear to bombers and GA versus fighters. AA around caps either was more stout or my plane was more weak and vulnerable or both. Every plane I flew "felt" different, obviously and the flights I had not only were meaningful to figure out what is the best direction to go as far as equipment but I must admit I had fun. I'm really looking forward to re-playing all my planes again, and working on them. 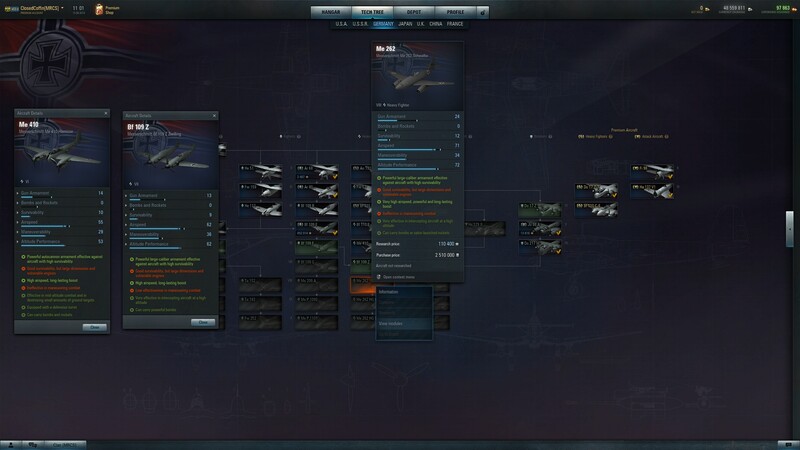 I don't personally see the point of having a huge air fleet of planes that basically just sit while you only play a handful of favorites that you have learned through skill and grinding that gives you your biggest advantage. Do something new, learn something new, play something different. I fully understand that there are still lots and lots of issues and complaints, and unfortunately, tech issues with many people. I'm excited about playing, and tinkering with my planes, so I have to say overall I think the patch has more good aspects than bad, so far. Unless my client is currently experiencing one of those Cache issues? Edited by hoom, 15 June 2018 - 02:54 PM. I noticed the defense bots were a lot more aggressive, which I think was more clear to bombers and GA versus fighters. AA around caps either was more stout or my plane was more weak and vulnerable or both. Yeah I felt like they seem to have stepped up too, thought it might just be feeling that way because I was running the A-26B a lot due to the Equipment mission I chose (normally just do the daily) but I did seem to be suffering more in other planes too. Yeah, I mainly put that down to having my speed/agility build Equipment ripped out. Had thought maybe some lag in my connection but if others having same then its probably the game. Also probably same cause for multiple cases getting the death camera, plane going into death spin while the game still shows you having plenty of health left. 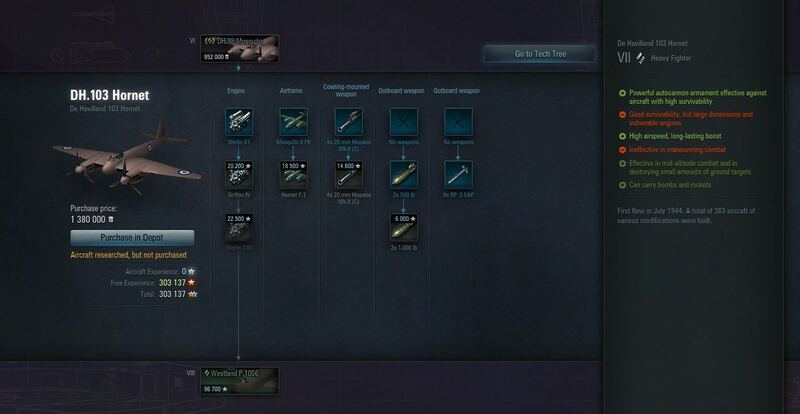 Stats are still available in the main tech tree pages. Edited by ClosedCoffin, 15 June 2018 - 03:07 PM. Those buyable materials are lootboxes? ... unless the plane is in 'Specialist' mode, the Advanced equipment has reduced performance. Edited by ClosedCoffin, 15 June 2018 - 03:31 PM. Ok, I was not aware of that last part. 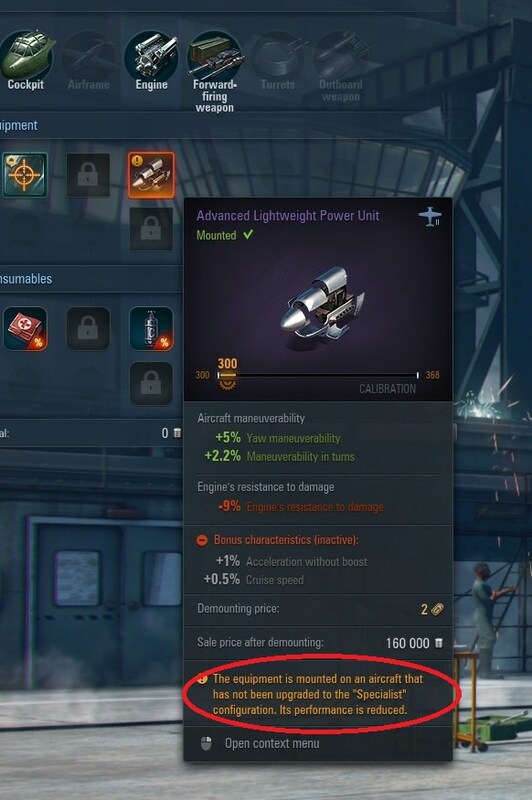 What's the point of switching back to Elite aircraft if not only am I missing key equipment slots, but also on better equipment altogether? Edited by ClosedCoffin, 15 June 2018 - 03:55 PM.